Hey everyone! 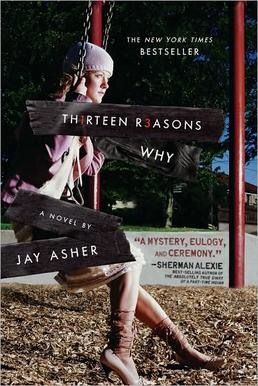 Today I’ve got a quick blog post looking at “Thirteen Reasons Why” by Jay Asher. I read this in ebook form as one of my nightly reads. I finished this in 3 nights, I think a total of about 3 1/2 hours, I was glued to it! I had added this to my TBR list ages ago but book reviews and other work had gotten in the way, and I just don’t know why it took me so long! Clay Jenson returns home from school to find a mysterious box with his name on it lying on his porch. Inside he discovers thirteen casette tapes recorded by Hannah Baker, his classmate and crush who committed suicide two weeks earlier. On tape, Hannah explains that there are thirteen reasons why she decided to end her life. Clay is one of them. If he listens, he’ll find out how he made the list. This is another fantastic book from this months TBR list. It starts off with Clay getting home to the thirteen tapes on his doorstep. When he opens it, he discovers 7 tapes, numbered 1 through 13 inside. Listening to the tapes, he quickly learns they’re from Hannah, a girl he had a crush on in school. The only problem being Hannah killed herself not long ago. Progressing through the tapes, you learn that they’re 13 reasons why Hannah killed herself. You also learn that if you’re listening to the tapes, you’re in there somewhere. The story takes place basically in one day, as Clay listens to these tapes, Hannah’s last story. This story is really personal, it gets straight to the heartstrings. It shows how one small thing you do may just be the thing that starts a snowball or pushes someone over the edge. I think it’s such an interesting read for teenagers and they should definitely get their hands on it, no better time to explain that all actions have consequences! The style of writing is lovely and I really wouldn’t have thought it to be a debut novel. High praises for Jay Asher for this one, a fantastic job. I’ve recently found out that this is being made into a 13 part Netflix series. I’m not 100% sure of the release date. Everything I found said 2016, eventually a Netflix page directed me to something that just said “2017”. Let’s hope it’s soon!